It takes time to learn the ropes to bidding on DealDash. However, you can win some really nice items at incredibly low prices if you are willing to do the work, the math and most of all have patience! If you are a newcomer, watch a couple of auctions from the beginning to end before bidding. 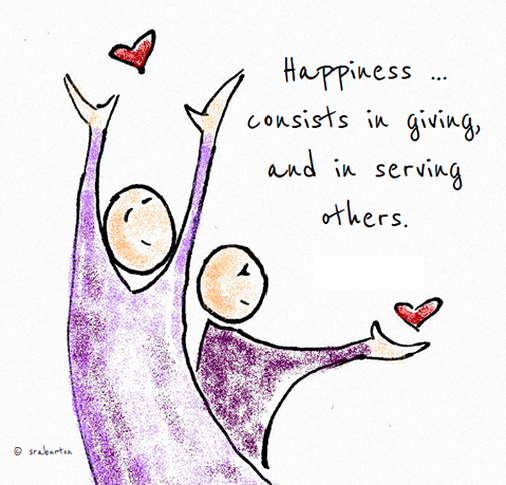 You learn a lot watching the bidding practices of others! Plan before entering an auction. Buy your bids when they are at the lowest price. The lowest I’ve seen is 220 bids @ .15 cents each totalling $33. I personally would not enter an auction with a buy it now price (BIN) of more then $30 based on 220 bids. Hope to Win but be prepared to lose. Find an auction that you would not mind buying now. Most important! Deal Dash is awesome in that you can still bid, have a great time, buy your item if you are not lucky and still get all your bids back! Resist over-bidding and spending way too much for the item you have selected. Say you choose to bid on a $10 Wal-mart gift card. Do the math first: $10 divided by .15 cents equals roughly 67 bids. There is a catch… you have to include the going auction price at all times! Say you jump in the auction at $4. Don’t place 67 bids on a $10 BIN auction that has reached an auction price of $4 already. If you won on the 67th bid you would be paying a total of $14 dollars for the auction you’ve just Won! Bids + Auction Price = Money Spent. auction! I like to wait until there are only three auto-bidders running. Eventually one of them is going to drop out and that is when I like to jump in! Of course I don’t mind jumping right back out for awhile if I happen to see a 4th bidder join in. I like to save as many bids as I can for the win but you got to watch the auction really close! Just the strategy that works best for me. I did all my Christmas shopping with items I won on Deal Dash for 2013! The free bids that Deal Dash offers is a really cool feature! Try not to abuse it and stomp on others to get free bids. Bid-Stompers rarely win an auction! They only accomplish irritating their opponents, raising the auction price and are most likely going to get stomped back! It takes an awful lot of bids to move that meter as you level-up! In the end they really only cheat themselves. Thanks for reading, Happy Bidding & Good Luck! This entry was posted in Bidding Tips, Home and tagged Auctions, Bidding, bids, Deal Dash, DealDash, Free bids, Tips on March 31, 2014 by . I do love winning items on Dealdash but I also love winning for others. I feels very good to give friends and family items I have won on Dealdash that they otherwise wouldn’t have or perhaps couldn’t afford. One example is the Honeywell Portable Electronic Ceramic Heater I won for $1.88. During the colder months, we get super cold at work so I knew if I won the heater, it would be perfect for my co workers. They loved it when I brought it in and plugged it in, it heats beautifully! My daughter joked that she has a hard time sleeping and really wanted a sound machine. So I won this Conair Sound Therapy for $0.28. Boy was she surprised when I gave it to her. She said it has helped her relax and get to sleep. 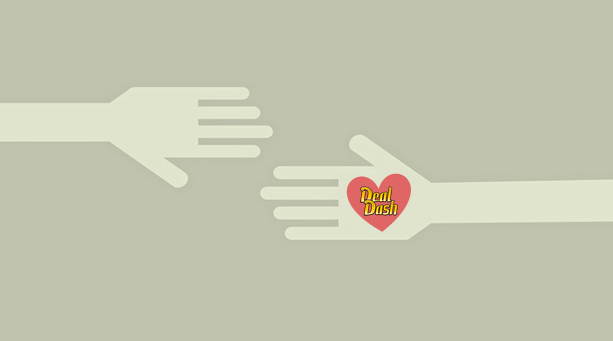 So Dealdash isn’t always about what you win for yourself, It’s also what you can win to improve someone else’s life. Dealdash gives you that opportunity to stretch your dollar in this economy. Thanks Dealdash! This entry was posted in Home and tagged Conair Sound Therapy, DealDash, Emerson Microwave, friends and family, Portable heater, Winning on March 28, 2014 by . 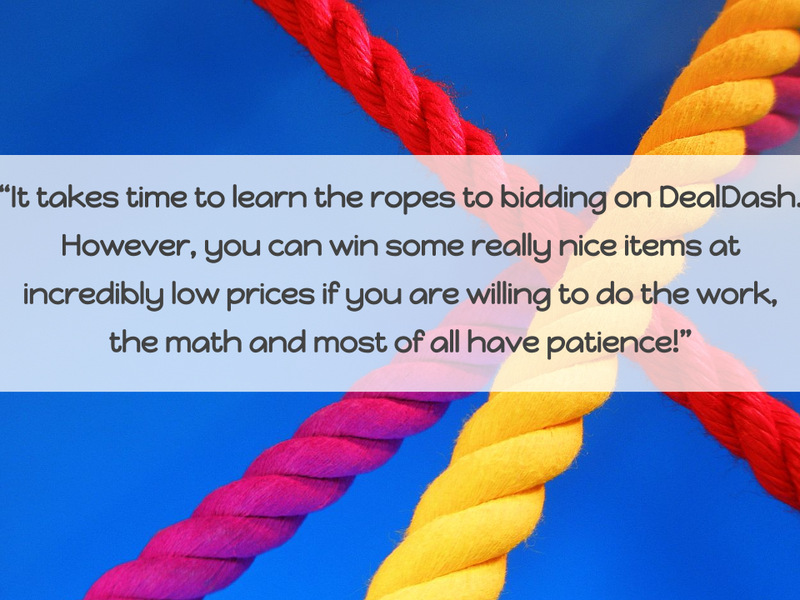 Bidding in a pay to play online auction like DealDash is all about discipline, patience and having realistic expectations. Terry B. explains the patience aspect well in his article Patience Patience Patience. Keep in mind that although someone may win an Apple iPad for $0.37, does not mean that’s always going to be the case. As you can see the average selling price for the Apple iPad Mini 32GB Black Slate is $79.22. In case you don’t know how to find the average selling price of an auction, just log out of your DealDash account. If you’re logged into your DealDash account you’ll see this normal view of the auction, what it sold for, who won, etc. The logged out view displays the item and average selling price of that item on DealDash. This works for any auction so go ahead and try it yourself. Hopefully this helps with your overall bidding strategy. I believe the secret to winning auctions is by staying active in it. However, before deciding to get involved and commit to an auction, it is imperative to stack up on bids. Eliminate the possibility or need to purchase bids after an auction has started and rather stay focused on the auction itself. This way you’re not scrambling to buy more bids or use one of your Buy it Now options to get additional bids loaded to your account in order to stay active in the auction you are bidding in. This entry was posted in Bidding Tips, Home and tagged Apple iPad, Average Selling Price, Bidding, DealDash, dealdash auctions, patience, Pay To Play on March 27, 2014 by . I’ve been a conservative recreational bidder, winner and shopper on DealDash since 2011. I’ve won approximately 50 auctions and used the BIN (Buy it Now) on approximately 50 auctions. Here’s an example of one of the large TV’s I won on DealDash at 54% off retail price. Here are 6 bidding tips I recommend to follow to help you win more auctions when bidding on DealDash.com. 1. Try bidding on something that you want which is of lower value at first and would buy anyway even if you did not win. 2. Place a bid on the item to “get in the auction” and then watch how the auction unfolds and how the bidding action takes pace. The reason you have to “get in the auction” is because on DealDash all auctions close to new bidders that did not place a bid before the auction reaches the $5 No Jumper limit. This helps keep reduce the amount of competition in the auctions. 3. If you notice that way too many people are bidding in the auction, it may be a good idea to wait until the same item comes up for auction again. 5. If you decide to bid, use the BidBuddy! You can always cancel your BidBuddy and the unused bids are returned back to your account or you can add more bids to the BidBuddy at anytime. 6. Be prepared to Buy it Now and get your bids back in case you lose the auction. This is a smart way to bid and keeps you from having to purchase more bids. 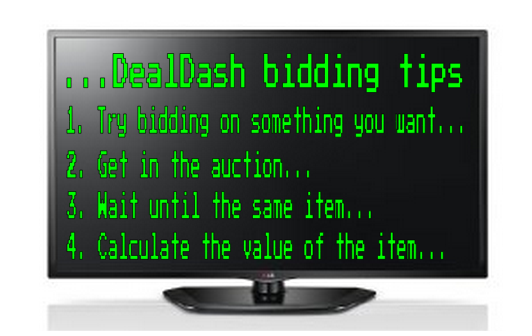 Choose to follow some of these bidding tips for a better shopping experience on DealDash.com! This entry was posted in Bidding Tips, Home and tagged Auction, Auctions, Bidding Tips, Buy it Now, Deal Dash, DealDash, DealDash Bidding Tips, DealDash Tips, dealdash.com, winning auctions on March 26, 2014 by . I have been bidding and winning on DealDash since September 2013. I have enjoyed the time spent and the thrill when I win. There are a few items that are the most challenging auctions to win on DealDash so if you are going to join the fray, you better have lots of bids and lots of time. Here are a few items I recognize as hard to win on DealDash. I have tried to win this $500 Walmart gift card on many occasions without success and believe this is a difficult auction to win. It’s a “One-Per-User” auction meaning you can only win this particular item one time. You can bid on as many times as you want and use the BIN (Buy it Now to get your bids back) however once you win it, that’s it, you can’t bid on this item again. Generally any gift card over $200 whether it’s a gift card for gas, home improvement, or Amazon; they are always in demand so you better plan if you try for any of these. Computers, laptops and tablets are popular and always bring a lot of bidders. To have a chance at winning these, it will take time and patience. Most of these items are also “One-Per-User” auctions, however there’s a variety of different types of computers, laptops and tablets available to bid on. Keep in mind the “One Per User” only applies to a specific model. So for example, someone could actually bid to win a “One-Per-User” Apple iPad Air 16GB Silver and they could also bid to win a Apple iPad Air 16GB Space Gray. Why? Because these are technically different auctions because they are a different color. A different color technically makes it a different item. This may seem strange, but even the $10 Burger King gift card can be a difficult auction to win. I have seen a $10 Burger King gift card auction close at almost the value of the card itself. Three recent auctions have closed at $9.95, $9.79 & $9.05. Add the cost of the bids used for each of these and you know the winner has paid more than $10; if they actually paid for the gift card to have it shipped. Another option when you win a item is to not pay anything and simply exchange it for some extra bids. Although I’m surprised to see this auction close at such a high price compared to the value, I have won this card twice. Both times I used Bid Buddy and left the computer to do other things only to come back and see I won! My suggestion to DealDash would be to close the auction on these high value items earlier than the $5 No Jumper limit. This lessens the pool of bidders giving each of the bidders a better opportunity to win. If these items are “One-Per-User”, you can also check to see who won the auction previously to help with your bidding strategy. Also, remember Bid Buddy (it does help) and keep an eye on the number of bids you have and make sure you enough when you try for a high value item. Below is a list of DealDash users who have won the “One-Per-User” Auction for the Apple iPad Air 16GB Silver and Space Gray. You can see the date it was sold, final selling price and which user won it! Calculate all these together and you’ll come up with the average selling price on DealDash. This entry was posted in Bidding Tips, Home and tagged Apple iPad Air, Auctions, Bidding, DealDash, how to win on DealDash, Walmart, Winning on March 25, 2014 by .